A set of policy briefs outlining key strategic policy recommendations and actions to prevent and control aflatoxin contamination along food and feed value chains in East Africa and its associated threat to human and livestock health, trade, and food security in the region, were officially launched at a two-day regional forum in Nairobi, Kenya, 15–16 August. Prof Boga (right) handing over a copy of the EAC policy briefs on aflatoxin control after the launch to IITA’s Victor Manyong, East Africa Hub Director. 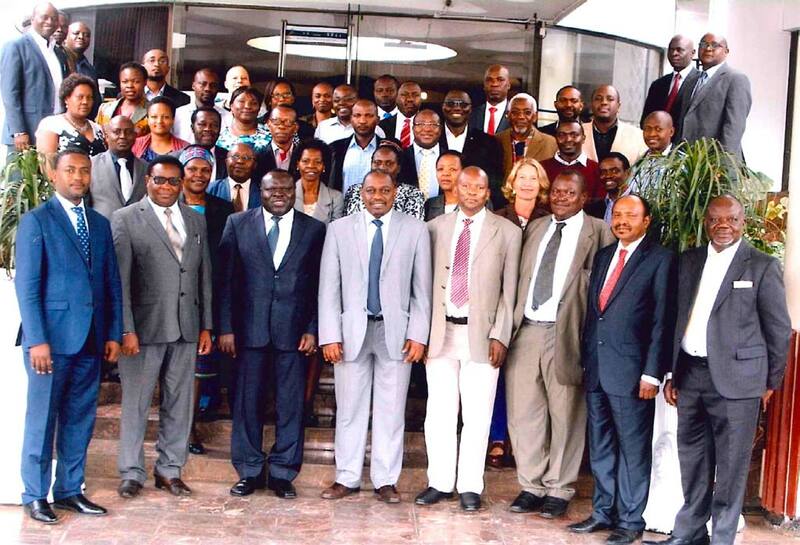 The event was organized by the East African Community (EAC) Secretariat in partnership with IITA and USAID. It was attended by members of the East Africa Legislative Assembly (EALA) Committee on Agriculture and delegates from the five EAC partner countries (Burundi, Kenya, Rwanda, Tanzania, and Uganda) and other development partners. The policy briefs, produced by the EAC, contain key findings and recommendations of 11 multisector technical papers developed under the EAC Aflatoxin Prevention and Control Project (APPEAR) funded by USAID East Africa Regional Economic Integration Office and led by IITA. The key objective of the project was to develop an EAC evidence-based aflatoxin implementation strategy and action plan for aflatoxin control and prevention along the health, agriculture, livestock, trade, industry, and environmental sectors. The policy briefs were launched by the Principal Secretary, State Department of Agriculture Research, Ministry of Agriculture, Livestock, Fisheries and Irrigation, Prof Hamadi Boga, who represented his Cabinet Secretary, Hon Mwangi Kiunjuri. Boga applauded the EAC Secretariat for the initiative, noting that Africa loses up to US$670 million annually from lost exports due to aflatoxin contamination. The EAC Deputy Secretary General in charge of Productive and Social Sectors, Hon Christophe Bazivamo, noted that aflatoxin prevention and control is one of the flagship programs implemented by the EAC Secretariat. “The overall goal of the program is to contribute to food and nutrition security as well as to protect human, animal, and plant health in EAC from the adverse impacts of aflatoxin along the food and feed value chains,” said Bazivamo. Leading the IITA delegation at the forum, Director for Eastern Africa Hub Victor Manyong pledged that IITA will continue working with the EAC Secretariat to silence the silent killer, aflatoxin. He also noted the importance of a conducive policy environment in addressing the aflatoxin challenge and noted IITA’s collaboration with EAC to develop the technical papers. “Developing knowledge and mitigation technology is only one thing. Getting the technology to be massively adopted by beneficiaries is an equally important challenge, which calls for a proper conducive policy environment,” he said. Other speakers from IITA included Charity Mutegi, Kenya Country Coordinator – Aflasafe Project and George Mahuku, Senior Plant Pathologist for Eastern, Southern and Central Africa, who presented papers on Effectively communicating about aflatoxins and Preharvest losses associated with aflatoxin and mitigation, respectively. Manyong also presented a paper on the Impact of aflatoxin on trade. Group photo of the conference participants. The nine policy briefs comprehensively look at all aspects of aflatoxin prevention and control. For more details, download and review the policy briefs here. At the end of the event, a Regional Forum was established to create awareness and sensitize high- level policymakers and other key stakeholders on the necessary policy action and interventions to address impacts and effects of aflatoxin.